I like Ethan Hawke, and that’s why I wish he wasn’t in this movie. I think Sinister will scare people who don’t see many horror movies, or maybe it will scare people who are easily frightened, but I don’t think this movie will be good enough for seasoned horror movie fans. Sinister is about true-crime author Ellison Oswalt (Hawke) and a missing-girl case that he is researching for his new book. Ellison is married to Tracy and they have a daughter named Ashley and a son named Trevor. Sidenote: Tracy has an out-of-place British accent that threw me off thoughout the movie. It just seemed odd to me. Moving along, we find out Ellison has moved his family into the exact house where the little girl disappeared right after her family was hung from a tree in the backyard. It gets pretty predictable from this moment forward…bad things happened to the family that used to live in the house so now bad things are going to happen to Ellison and his family. We find out a demon named Bughuul is involved (thanks Vincent D’Onofrio!) and he likes to possess children, have them kill their families, and then he eats their soul. 1. It just isn’t scary. This movie relies on a lot of jump scares, loud noises and misunderstandings but very rarely do you get a true scare. I will give credit to the tension build-ups, and once some ghosts started to appear the movie got better. 2. The deputy (and I) figured it out before Ellison did. Ellison is a true crime writer. He’s built a reputation on putting together clues that the police departments often overlooked. Yet he seemed surprised when the deputy called him and told him how this all would end. This is odd to me because the movie spoiled itself well before the ending came along. In fact, I spent most of the movie waiting to see if I was right…and I was. 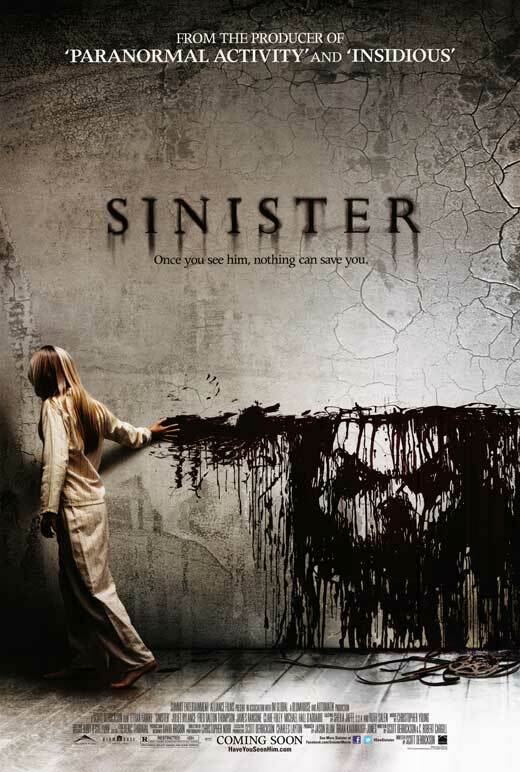 Overall, I’d say Sinister is an okay movie but I wouldn’t rush out to see it. Have you seen Sinister? What did you think?